OLE DB is a set of COM-based interfaces that expose data from a variety of sources. Scenario: You are a web server administrator and you got a web site or an application given by developer which is working fine on the developer machine now you have hosted the web site on the Web Server IIS 7 or IIS 8 and its working fine but a little while later a developer call to you and says he is unable to upload the excel files. 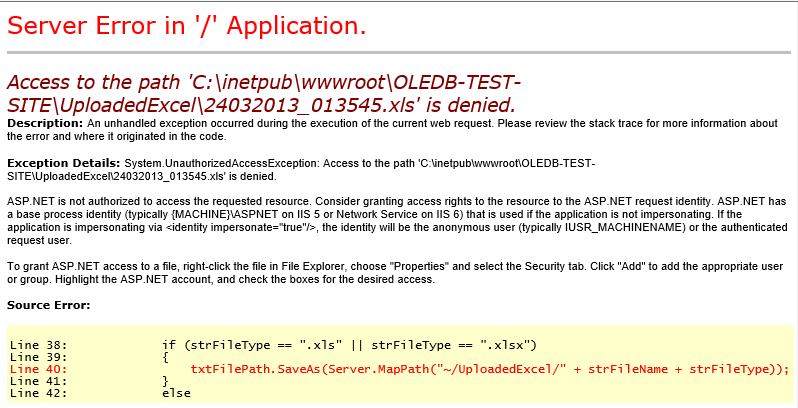 Error 1: Access to the path 'C:\inetpub\wwwroot\OLEDB-TEST-SITE\UploadedExcel\24032013_013545.xls' is denied. 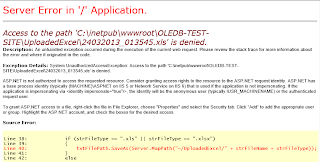 This error comes because the folder where the file is uploaded doesn't have a write permission to solve this give the IIS_IUSRS write permission on the folder where the files are uploaded. When uploading .xls file your getting this error ( The 'Microsoft.Jet.OLEDB.4.0' provider is not registered on the local machine. To solve this problem you have to download and install "2007 Office System Driver: Data Connectivity Components" on the web server the link is given at the bottom to this blog. 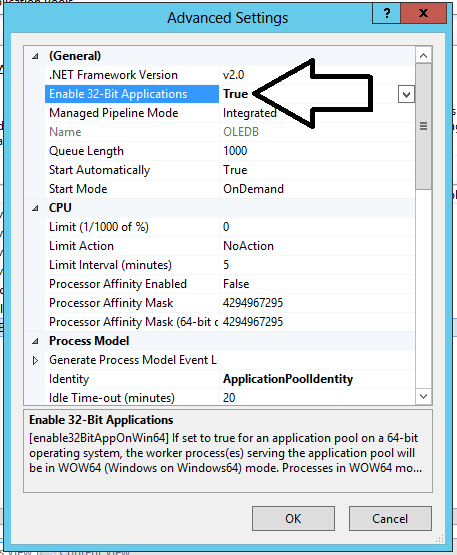 Also you have to "Enable 32-bit Applications to True" in IIS Application Pool for the web application if you want to upload the .xls files. To solve this problem you have to download and install "Microsoft Access Database Engine 2010" on the web server the link is given at the bottom to this blog. 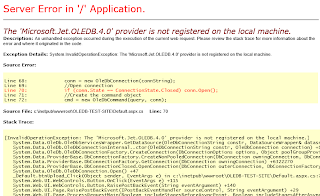 Also you can download the test web application to test the OLEDB provider is registered on the local machine or not. = if your facing? any technical problem or have any suggestion post your comment here or catch me on google+ or Gtalk :D! Thanks, Error #2 fixed it for me! when i download Microsoft Access Database Engine 2010 it requires for me to delete certain which then don't let me use any of other other Microsoft products. hi what is the error you're getting please provide a screen short. sorry but i have know idea. I am getting this error too.. 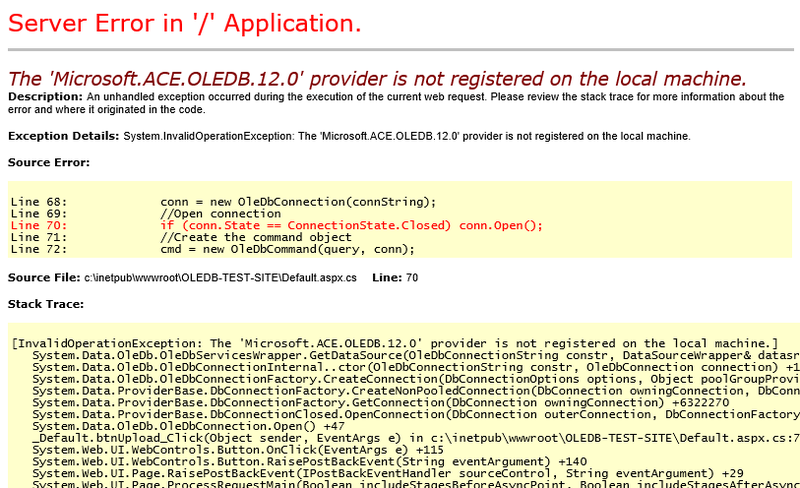 I just installed the Access Database Engine 2010 but still get the same Microsoft.Jet.OLEDB.4.0...error when I run the app. The app is already compiled so changing target compilation is not an option for me. Thanks. It has been of great help. In order to avoid installing and enabling 32bit Data Connectivity Components on 64bit web server, just install 64bit Microsoft Access Database Engine 2010 and change the connection string from "Microsoft.Jet.OLEDB.4.0" to "Microsoft.ACE.OLEDB.12.0" and everything should work just fine, since it is backwards compatible. You are amazing !!! I was working on this for hours and you just solved my problem only with this little post :-) Thanks. Thanks , it Helps for me. 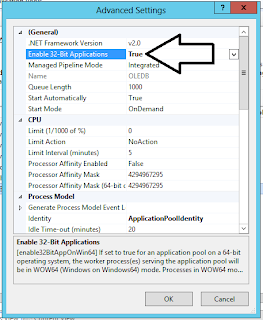 have to set Enabled 32 bit to True for Application pool which is assigned for application. Thank you for sharing. This has helped to solve my problem. I advise everyone to fix the number 2. If this does not help, try replacing the dll filehttp://fix4dll.com/msvcp110_dll. It always helps. Good luck.